No Doze is a simple mod that removes the ability for the player to sleep the night away. Players are still able to set their spawn location using a Bed. By default they are able to do so during the day as well as night, this behavior can be changed in the configuration file however to restrict setting their spawn to night time. No Doze functions be setting the result of the PlayerSleepInBedEvent to OTHER_PROBLEMS thereby negating the ability to sleep. Anything that fires off that event will also be affected. Thanks for making this! It goes great with mods that require you to do stuff at night-time, like Astral Sorcery or Roots. And because of how vanilla handles bed notifications now, this doesn't even post anything to the chat either, which fixes something the previous commenter mentioned. The ability to use the notification bar is actually really awesome, I hope more mods start to take advantage of it instead of spamming chat. 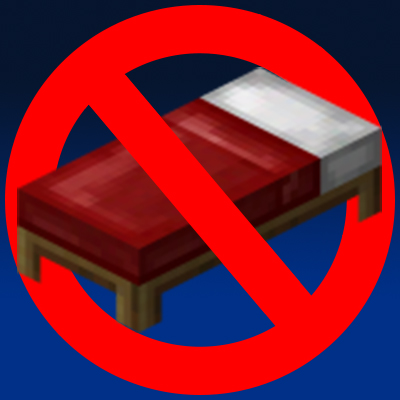 The mod would feel much more polished if you could still get in a bed, but it wouldn't skip the night, and maybe make it so you can always get in a bed regardless of the time. I'm sory if this is hard to do. I just hate chat notifications.